Today’s Gospel reading cuts right to the heart of the matter – and asks the question: do we have faith in our Lord Jesus Christ? Jesus want us all to walk toward Him – in faith – on the “water” of our life. He wants us to cast aside our fears and commit to Him with a radical faith. 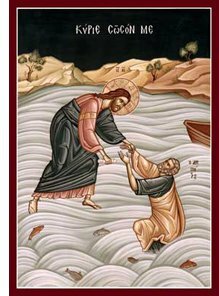 We are all like St. Peter; we want to walk on the water toward Jesus but the winds of doubt mingle with the inner turmoil of our own hearts, and the circumstances of our own life, to affect our faith. Peter’s faith was tested – as ours is – everyday. His example of calling out to the Lord – in faith – should be our prayer, too, especially when we pick up the tools of our art and begin to feel the winds of self-doubt and dissatisfaction brush against our cheeks.